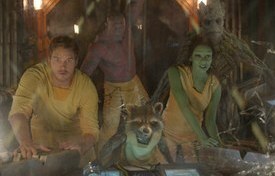 “Guardians of the Galaxy”: Surprise smash hit of the summer has an unlikely new Marvel team shooting for laughs and defending the universe from itself: Peter Quill, a brash, immoral human space adventurer; Rocket, a gun-toting genetically modified raccoon; Groot, a tree-like humanoid; the deadly assassin Gamora; and the revenge-driven Drax. The absorbing space opera — harking back to the tomngue-in-check days of early TV and movie serials — kicks off when Quill steals a coveted orb and becomes the object of a relentless intergalactic bounty hunt. To evade his enemies, he forges an uneasy truce with the other misfits to form The Guardians of the Galaxy. But when Quill discovers the true power of the orb, he must rally his ragtag band for a desperate battle that will decide the fate of the universe. The ensemble cast work great together and it shows on the screen; it’s great fun to watch. Stars Chris Pratt, Zoe Saldana, Dave Bautista, Vin Diesel, Bradley Cooper, Lee Pace, Michael Rooker, Karen Gillan, Djimon Hounsou, John C. Reilly, Glenn Close, Benicio Del Toro. Extras include deleted scenew, making-of featurettes, gag reel, commentary. From Disney. “Calvary”:Brendan Gleeson delivers a tour-de-force performance in this darkly comic tale of murder and morality from acclaimed writer-director John Michael McDonagh (“The Guard”). Father James (Gleeson) is a good priest who feels sinister forces closing in after being threatened by a mysterious parishioner. As he continues to comfort the troubled members of his windswept, small-town community, including his own fragile daughter (Kelly Reilly), Father James begins to wonder if he will have the courage to face his own personal Calvary. Chris O’Dowd turns in a sensational performance as a suspicious townsman with ulterior motives. Not to be missed. From Fox. 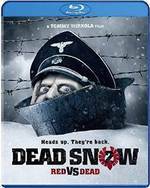 “Dead Snow 2: Red vs Dead” (2014 — Norway) is the unbelievably fabulous sequel to the 2009 cult zombie hit about a ski vacation that turns horrific when a group of medical students resurrect an army of Nazi Zombies led by one Oberst Herzog; before that film was over, only one man, Martin, was left alive; his friends were devoured, he accidentally killed his girlfriend with an axe, and then cut his own arm off with a chainsaw. This sequel, which outperforms the original in every way, picks up the following morning when Martin wakes up in a hospital bed with a new arm — but it’s a super-powered Zombie arm that wants to kill him and anything else it can reach. Martin escapes, meets up with a trio of zombie killers from the U.S., called the Zombie Squad, and figures out a way to deliver some payback to Colonel Herzog — by raising an undead army of his own. Funny, clever, intelligent, self-referential and with some great special effects, this has to be one of the best zombie films ever made. There’s a refreshingly original storyline, fine acting and solid direction; helmer Tommy Wirkola knows his stuff (and has a great sense of humor — he not only pokes fun at zombie films in general but at his own zombie film). Warning: “Dead Snow 2” has an ending like no other zombie film — strike that, like no other film — ever. You will not believe your eyes. Stars Vegar Hoel, Orjan Gamst, Martin Starr, Jocelyn DeBoer, Ingrid Haas. On DVD, Blu-ray Disc. Highly recommended. From Well Go USA. From The Criterion Collection this week: “The Night Porter” (1974), an unsettling drama from Italian filmmaker Liliana Cavani about a concentration camp survivor (Charlotte Rampling) who discovers her former torturer and lover (Dirk Bogarde) working as a porter at a hotel in postwar Vienna. When the couple attempt to re-create their sadomasochistic relationship, his former SS comrades begin to stalk them. … In “Safe” (1995), Julianne Moore gives a breakthrough performance as Carol White, a Los Angeles housewife in the late 1980s who comes down with a debilitating illness. After the doctors she sees can give her no clear diagnosis, she comes to believe that she has frighteningly extreme environmental allergies. A profoundly unsettling work from director Todd Haynes … and “Time Bandits”(1981), Terry Gilliam’s fantastic voyage through time and space about a boy who escapes his gadget-obsessed parents to join a band of time-traveling dwarves. Armed with a map stolen from the Supreme Being (Ralph Richardson), they plunder treasure from Napoleon (Ian Holm) and Agamemnon (Sean Connery) — but Evil (David Warner) is watching their every move. All three releases are available in Blu-ray and DVD versions. 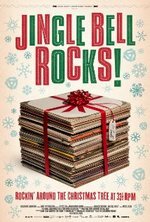 In “Jingle Bell Rocks!” (2014), director Mitchell Kezin delves into the minds of some of the world’s most legendary Christmas music fanatics in a quest for the best, underappreciated Christmas songs ever recorded. Kezin’s obsession with offbeat Christmas music — “Why, when Christmas rolls around, are we still stuck cozying up with Bing Crosby under a blanket of snow?” — takes him around the country to search the dusty shelves of obscure record stores and meet some other holiday music fanatics and collectors, including hip-hop legend Joseph “Rev Run” Simmons of RUN-D.M.C., The Flaming Lips’ frontman Wayne Coyne, filmmaker John Waters, bebopper Bob Dorough, L.A. DJ and musicologist Dr. Demento, and Calypso legend The Mighty Sparrow. As long as Kezin sticks with the hunt for rare records, the film runs smoothly; when he starts to plumb the deeper, psychological depths of the obsession, the film bogs down into a quagmire of touchy-feely emotions. Still, it’s a fun outing and, heck, it turned me on to a bunch of alternative Christmas musical offerings. From Oscilloscope. Check out other December 9-15 DVD releases and reviews at OnVideo.